Burton originally did not want to direct another Batman film. Warner Bros. developed a script with Sam Hamm which had the Penguin and Catwoman going after hidden treasure. Burton agreed to return after they granted him more creative control and replaced Hamm with Daniel Waters. After a falling out, Waters was removed from the project and Wesley Strick was chosen to do an uncredited rewrite shortly before filming. This included normalizing dialogue, fleshing out the Penguin's motivations and master plan and removing scenes due to budget concerns. Strick continued working as the on-set writer all through filming, an early trailer credited Strick as co-screenwriter with Waters having sole story credit but after a dispute from Hamm he received no credit whatsoever. Annette Bening was originally cast as Catwoman but became pregnant and was replaced with Pfeiffer. Batman Returns was released on June 19, 1992. It grossed $266.8 million worldwide on a budget of $80 million and received positive reviews. Critics praised its action sequences, performances, Danny Elfman's score, effects, and villains, although its dark tone was criticized. The film was nominated for two Academy Awards: Best Visual Effects and Best Makeup, as well as two BAFTA awards. A sequel, Batman Forever, was released in 1995, with Val Kilmer replacing Keaton as Batman. In the prologue, socialites Tucker and Esther Cobblepot give birth to a deformed baby boy, Oswald. Disgusted by his appearance and wild demeanor, they confine the baby to a cage and ultimately throw him into the sewer, where he is discovered by a family of penguins at Gotham Zoo. Thirty-three years later, millionaire Max Shreck proposes to build a power plant to supply Gotham City with energy, though he is opposed by the city mayor. During Shreck's speech, Gotham is attacked by a disgraced former circus troupe, the Red Triangle Gang. Despite the efforts of Batman to stop the violence, Shreck is abducted and taken to the sewer, where he meets Oswald Cobblepot, the gang's secret leader now known as the Penguin. The Penguin blackmails Shreck with evidence of his corporate crimes into helping him return to the surface, and he accepts. Meanwhile, Shreck's secretary, Selina Kyle, discovers the true purpose of Shreck's power plant to drain Gotham of its energy and bring the city under Shreck's control. Shreck pushes her out of a window to silence her, but she survives the fall and vows revenge, taking up the mantle of Catwoman. The Penguin makes his presence known by "rescuing" the Mayor's baby from a staged kidnapping attempt, and requests to be allowed into the Hall of Records to find his parents. Batman's alter-ego, Bruce Wayne, voices his suspicions about the Penguin's true motives, and investigates his background and connection to the Red Triangle Gang. During a meeting with Shreck, Wayne meets Kyle and the two become attracted to one another. In order to remove his enemies, Shreck pushes for the Penguin to run for mayor and discredit the current mayor by having the Red Triangle Gang wreak havoc on the city. Batman intervenes and meets Catwoman as she attempts to sabotage one of Shreck's businesses; she escapes, but is injured and swears revenge on Batman by allying with the Penguin to frame him for an undiscussed crime. As Wayne and Kyle begin a romantic relationship, the Penguin abducts Gotham's Ice Princess and kills her, framing Batman for the act, at the same time sabotaging his Batmobile to rampage throughout Gotham (until Batman disconnects the controlling device), and ends his partnership with Catwoman, who didn't anticipate the murder, when she rejects his advances; he attempts to kill her with one of his flying umbrellas, but she survives after falling into a greenhouse. During the chase, Batman records the Penguin's disparaging remarks about the people of Gotham and later plays them during his next speech, destroying his image and forcing him to retreat to the sewer, where he reveals his plan to abduct and kill all of Gotham's firstborn sons as revenge for what his parents did to him. At a charity ball hosted by Shreck, Wayne and Kyle meet and discover each other's secret identities. The Penguin appears and reveals his plan, intending to take Shreck's son, Chip, with him, but Shreck gives himself up in his son's stead. Batman foils the kidnappings and heads for the Penguin's lair. The Penguin attempts to have his army of penguins bomb the city and kill everyone in Gotham, though Batman and his butler, Alfred, jam the signal and order the penguins to head back to the sewer. Batman arrives and confronts the Penguin. In the ensuing fight, the Penguin falls through a window into the sewer's toxic water. Shreck escapes but is confronted by Catwoman, who intends to kill him. Batman pleads for Kyle to stop, unmasking himself in the process. Shreck draws a gun and shoots Wayne, and then shoots Kyle multiple times, but she survives and electrocutes herself and Shreck with a stun gun. Wayne, who was wearing body armour, finds Shreck's corpse but Kyle is nowhere to be found. The Penguin emerges from the water, but eventually dies from his injuries and from the toxic sewage, and his penguin family lay his body to rest in the water. In the aftermath, as Alfred drives him home, Wayne sees Kyle's silhouette in an alley but only finds her cat, who he decides to take home with him. The Bat-Signal appears in the sky as Catwoman, who survived, watches. "Max Shreck" redirects here. It is not to be confused with Max Schreck. Michael Keaton as Bruce Wayne / Batman: The protector of Gotham City and the Caped Crusader. Bruce struggles with his dual identity as a crime fighter, becoming romantically involved with Selina Kyle, alias Catwoman. Keaton earned $11 million for reprising his role as the Caped Crusader as director Tim Burton thought that Keaton deserved it. 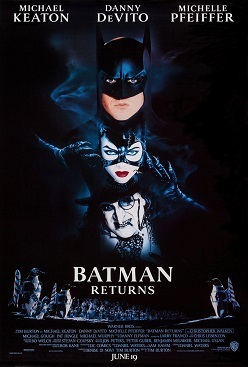 Batman Returns was Keaton's final film as Batman, as he was subsequently replaced by Val Kilmer and George Clooney in Batman Forever and Batman & Robin, respectively. Danny DeVito as Oswald Cobblepot / The Penguin: A psychopathic, deformed man born as Oswald Cobblepot who was abandoned by his parents when he was a baby. Raised by penguins of an abandoned zoo, he returns for revenge thirty-three years later as leader of the Red Triangle Circus Gang after being cheated by businessman Max Shreck. DeVito was suggested for the role by his friend Jack Nicholson after the financial success of the first film, in which Nicholson played the Joker. According to DeVito, "It was four-and-a-half hours of makeup and getting into the costume. We got it down to three hours by the end of the shoot". Dustin Hoffman was originally the first choice to play the Penguin, but he declined. Apart from Hoffman, Marlon Brando, John Candy, Bob Hoskins, Ralph Waite, Dean Martin, Dudley Moore, Alan Rickman, John Goodman, Phil Collins, Charles Grodin, Christopher Lee, Joe Pesci, Ray Liotta, Gabriel Byrne, Alex Rocco and Christopher Lloyd were all considered for the part before DeVito got it. Michelle Pfeiffer as Selina Kyle / Catwoman: A normal woman who becomes a criminal after being almost killed by her boss Max Shreck, who later decides to try everything to kill her. She is held as a femme fatale in most of the film. According to Michelle Pfeiffer, who was previously considered to play Vicki Vale in the previous film but turned down due to reportedly being in a relationship with Michael Keaton at the time, she felt devastated after Annette Bening was cast as Catwoman. However, Bening became pregnant, allowing Pfeiffer to get the role. Pfeiffer's $3 million salary was $2 million more than was offered to Bening. To prepare for the role, Pfeiffer attended kickboxing classes and practised handling a whip (during which she accidentally cut her teacher's chin). Susan Sarandon, Meryl Streep (who was considered "too old" by Burton), Brooke Shields (who Burton considered "not bankable"), Demi Moore, Nicole Kidman (who ended up playing Dr. Chase Meridian in Batman Forever), Jodie Foster, Geena Davis, Sigourney Weaver, Lena Olin, singer Madonna, Raquel Welch, Cher, Ellen Barkin, Jennifer Jason Leigh, Lorraine Bracco, Bridget Fonda and Jennifer Beals were also considered for the role, but they lost out to Pfeiffer. Christopher Walken as Max Shreck: A wealthy businessman and industrialist known as "The Santa Claus of Gotham". He is obsessed with building a power chemical plant in Gotham City, but when both Bruce Wayne and the Mayor of Gotham City deny his idea, he decides to help Oswald Cobblepot to become the new mayor of Gotham City for his plans. Apart from being the father of Chip Shreck and presumably killing his wife to gain her money, Shreck is also the former employer of Selina Kyle, who wants to kill him following his attempt to kill her. The character was created by writer Daniel Waters and named in-joke after the late German actor Max Schreck, who starred in Nosferatu. Apart from this, Shreck fulfils what would have been Harvey Dent's role if Billy Dee Williams hadn't opted out of this film. Singer David Bowie, who was previously considered to play the Joker in the first film, was in contention for the role of Shreck, but he declined in order to appear in David Lynch's Twin Peaks: Fire Walk with Me. Michael Gough as Alfred Pennyworth: The Wayne family's butler and Batman's accomplice, who has helped and raised him since his parents' death. Along with Pat Hingle, Gough was one of the few actors who appeared in all four films of the initial Batman film series. Pat Hingle as Commissioner James Gordon: Commissioner of the Police Department of Gotham City. Along with Michael Gough, Hingle was one of the few actors who appeared in all four films of the initial Batman film series. Michael Murphy as The Mayor: The unnamed mayor of Gotham City. He doesn't like Max Shreck's idea to build a nuclear power plant in Gotham City. His son is later kidnapped by the Red Triangle Circus Gang, only to be "saved" by the Penguin. Vincent Schiavelli as The Organ Grinder: A member of the Red Triangle Circus Gang and the Penguin's right-hand man. He carries an organ grinder as his main weapon. He survives all three attacks on Gotham City, but is captured and presumably interrogated by Batman during the Penguin's final attempt to take over Gotham City. Schiavelli had previously co-starred with DeVito in several episodes of the sitcom Taxi. Andrew Bryniarski as Charles "Chip" Shreck: Son of Max Shreck and his late wife. Apart from being the heir of Max's business, he is brave enough to do everything he can to defend his father, such as ordering him to flee as he helps other Gotham City residents to retain members of the Red Triangle Circus Gang. Cristi Conaway as The Ice Princess: A Christmas-themed beauty queen and model of Gotham City. Rick Zumwalt as The Tattooed Strongman: A member of the Red Triangle Circus Gang. He survives the first attack on Gotham City, but is killed during the second attack by one of his bombs when Batman throws him into a hole before the explosion. Anna Katarina as The Poodle Lady: A member of the Red Triangle Circus Gang. She survives all three attacks on Gotham City, but she runs away along with her poodle to escape from Batman during the third attack, abandoning her teammates. Paul Reubens as The Penguin's Father (Tucker Cobblepot): The father of Oswald Cobblepot and husband of Esther Cobblepot. He and his wife abandoned their son by throwing him into Gotham City's park river after realizing that he could be a danger to society after he killed their cat. Burgess Meredith, the actor who played the Penguin in the 1960s Batman TV series, was originally asked to play Tucker, but he declined due to his health problems which culminated with his death in 1997. Reubens would later reprise his role as the Penguin's father in the 2016 second season of the television series Gotham, though named Elijah Van Dahl and set in a different continuity. Diane Salinger as The Penguin's Mother (Esther Cobblepot): The mother of Oswald Cobblepot and wife of Tucker Cobblepot. She and her husband abandoned their son by throwing him into Gotham City's park river after realizing that he could be a danger to society after he killed their cat. After the success of Batman, Warner Bros. was hoping for a sequel to start filming in May 1990 at Pinewood Studios. They spent $250,000 storing the sets from the first film. Tim Burton originally did not want to direct another film in the franchise. "I will return if the sequel offers something new and exciting", he said in 1989. "Otherwise it's a most-dumbfounded idea." Burton decided to direct Edward Scissorhands for 20th Century Fox. Meanwhile, Sam Hamm from the previous film delivered the first two drafts of the script, while Bob Kane was brought back as a creative consultant. Hamm's script had the Penguin and Catwoman going after hidden treasure. Burton was impressed with Daniel Waters' work on Heathers; Burton originally brought Waters aboard on a sequel to Beetlejuice. Warner Bros. then granted Burton a large amount of creative control. Denise Di Novi and Burton became the film's producers. The first film's producers Jon Peters and Peter Guber became executive producers, joining Benjamin Melniker and Michael E. Uslan. Dissatisfied with the Hamm script, Burton commissioned a rewrite from Waters. Waters "came up with a social satire that had an evil mogul backing a bid for the Mayor's office by the Penguin", Waters reported. "I wanted to show that the true villains of our world don't necessarily wear costumes." The subplot of the Penguin running for Mayor came from the 1960s TV series episodes "Hizzoner the Penguin" and "Dizzoner the Penguin". Waters wrote a total of five drafts. On the characterization of Catwoman, Waters explained "Sam Hamm went back to the way comic books in general treat women, like fetishy sexual fantasy. I wanted to start off just at the lowest point in society, a very beaten down secretary." Harvey Dent appeared in early drafts of the script, but was deleted. His disfiguring appearance of Two-Face would have appeared in the climax when Catwoman kisses him with a taser to the face, which was replaced with Max Shreck. Waters quoted, "Sam Hamm definitely planned that. I flirted with it, having Harvey start to come back and have one scene of him where he flips a coin and it's the good side of the coin, deciding not to do anything, so you had to wait for the next movie." In early scripts Max Shreck was the "golden boy" of the Cobblepot family, whereas The Penguin was the deformed outsider. It turned out that Shreck would be the Penguin's long-lost brother. Max Shreck was also a reference to actor Max Schreck, known for his role as Count Orlok in Nosferatu. Burton hired Wesley Strick to do an uncredited rewrite. Strick recalled, "When I was hired to write Batman Returns (Batman II at the time), the big problem of the script was the Penguin's lack of a 'master plan'." Warner Bros. presented Strick with warming, or freezing Gotham City, a plot point they would later use in Batman & Robin. Strick gained inspiration from a Moses parallel that had the Penguin killing the firstborn sons of Gotham. A similar notion was used when the Penguin's parents threw him into a river as a baby. Robin appeared in the script, but was deleted because Waters felt the film had too many characters. Waters called Robin "the most worthless character in the world, especially with [Batman as] the loner of loners". Robin started out as a juvenile gang leader, who becomes an ally to Batman. Robin was later changed to a black teenage garage mechanic. Waters explained, "He's wearing this old-fashioned garage mechanic uniform and it has an 'R' on it. He drives the Batmobile, which I notice they used in the third film!" Marlon Wayans was cast, and signed for a sequel. The actor had attended a wardrobe fitting, but it was decided to save the character for a third installment. Michael Keaton returned after a significant increase in his salary to $10 million. Annette Bening was cast as Catwoman after Burton saw her performance in The Grifters, but she dropped out due to her pregnancy. Raquel Welch, Jennifer Jason Leigh, Madonna, Ellen Barkin, Cher, Bridget Fonda, Lorraine Bracco, Jennifer Beals and Susan Sarandon were then in competition for the role. Sean Young, who was originally chosen for Vicki Vale in the previous film, believed the role should have gone to her. Young visited production offices dressed in a homemade Catwoman costume, demanding an audition. Burton was unfamiliar with Michelle Pfeiffer's work, but was convinced to cast her after one meeting. Pfeiffer received a $3 million salary, $2 million more than Bening, and a percentage of the box office. The actress undertook kickboxing lessons for the role and trained with an expert to master the whip. Kathy Long served as Pfeiffer's body double. On Danny DeVito's casting, Waters explained, "I kind of knew that DeVito was going to play the Penguin. We didn't really officially cast it, but for a short nasty little guy, it's a short list. I ended up writing the character for Danny DeVito." Burgess Meredith (who portrayed the Penguin in the 1960s TV series Batman) was cast for a little cameo as Tucker Cobblepot, Penguin's father, but illness prevented him from it and that role was taken by Paul Reubens. In early 1991, two of Hollywood's largest sound stages (Stage 16 at Warner Bros. and Stage 12 at Universal Studios) were being prepared for the filming of Batman Returns. Filming started in June 1991. Stage 16 held Gotham Plaza, based on Rockefeller Center. Universal's Stage 12 housed Penguin's underground lair. A half-a-million gallon tank filled with water was used. Burton wanted to make sure that the penguins felt comfortable. Eight other locations on the Warner Bros. lot were used; over 50% of their property was occupied by Gotham City sets. Animal rights groups started protesting the film after finding out that penguins would have rockets strapped on their backs. Richard Hill, the curator of the penguins, explained that Warner Bros. was very helpful in making sure the penguins were comfortable. "On the flight over the plane was refrigerated down to 45 degrees", recalls Hill. "In Hollywood, they were given a refrigerated trailer, their own swimming pool, half-a-ton of ice each day, and they had fresh fish delivered daily straight from the docks. Even though it was 100 degrees outside, the entire set was refrigerated down to 35 degrees." This made it very cold for Michelle Pfeiffer, who was most of the time clad only in a thin latex catsuit. According to the American Humane Association's On-Set Oversight, The six Emperor penguins that act as pallbearers for the Penguin's body at the end of the film, were little people dressed as Emperor penguins. The streets of Gotham City use the old Brownstone Street and Hennessy Street on the Warners' backlot. Bo Welch, Burton's collaborator on Beetlejuice and Edward Scissorhands, replaced Anton Furst as production designer, since Furst was unable to return for the sequel due to contractual obligations with Columbia Pictures (as he was working on what would be his final credited work prior to his suicide, Awakenings). Welch blended "Fascist architecture with World's fair architecture" for Gotham City. He also studied Russian architecture and German Expressionism. An iron maiden was used for Bruce Wayne's entry into the Batcave. Stan Winston, who worked with Burton on Edward Scissorhands, designed Danny DeVito's prosthetic makeup, which took two hours to apply. DeVito had to put a combination of mouthwash and red/green food coloring in his mouth "to create a grotesque texture of some weird ooze." More than 60 latex Catsuits were created for the six-month shoot at $1,000 each. The initial concept for the design came from Tim Burton, who envisioned a stuffed cat with its stitches coming apart at the seams. The prototype was created around a body cast of Pfeiffer so that it would fit her exactly, and painted with white silicone rubber to imitate stitches. It was extremely tight and very laborious to put on – Michelle Pfeiffer had to be covered in talcum powder to squeeze into the costume, which was in turn brushed with liquid silicone on every take to give it shine. Pfeiffer might wear the suit for 12 to 14 hours at a time, except lunch breaks when it was removed, which was her only opportunity to use the bathroom during the workday. The Batsuit was updated, which was made out of a thinner, slightly more flexible foam rubber material than the suit from Batman, and the logo was changed to better reflect how it looked in the comics. The new bat-suit also had a zipper for urination and the upper body build did not look like a muscular physique. DeVito was uncomfortable with his costume, but this made it easy for him to get into character. J. P. Morgan's wardrobe was used for inspiration on Max Shreck's costume design. Danny Elfman had great enthusiasm for returning because "I didn't have to prove myself from the first film. I remember Jon Peters was very skeptical at first to hire me." Elfman's work schedule was 12 hours a day, 7 days a week. "When completing this movie I realized it was something of a film score and an opera. It was 95 minutes long, twice the amount of the average film score." Burton allowed Elfman to be more artistic with the sequel score, such as the "scraping" on violins for the cat themes. Under the pressure of finishing the score, however, the relationship between the two strained, which — along with further "creative differences" on The Nightmare Before Christmas — led Burton to use Howard Shore to score his next film Ed Wood. The musician co-orchestrated "Face to Face", which was written and performed by Siouxsie and the Banshees. The song can be heard in one scene during the film and during the end credits. Batman Returns was released in America on June 19, 1992, earning $45.69 million in 2,644 theaters on its opening weekend. This was the highest opening weekend in 1992 and the highest opening weekend of any film up to that point. The film went on to gross $162.83 million in North America, and $104 million in foreign countries, coming to a worldwide total of $266.83 million. Batman Returns was the third highest-grossing film in America of 1992, and sixth highest in worldwide totals. Batman Returns was criticized by some for being too dark and violent, but nonetheless received positive reviews. On Rotten Tomatoes, the film has an approval rating of 80% based on 75 reviews, with an average rating of 6.73/10. The site's critical consensus reads, "Director Tim Burton's dark, brooding atmosphere, Michael Keaton's work as the tormented hero, and the flawless casting of Danny DeVito as The Penguin, and Christopher Walken as, well, Christopher Walken make the sequel better than the first." Audiences polled by CinemaScore gave the film an average grade of "B" on an A+ to F scale. Peter Travers in Rolling Stone wrote: "Burton uses the summer's most explosively entertaining movie to lead us back into the liberating darkness of dreams." He praised the performances: "Pfeiffer gives this feminist avenger a tough core of intelligence and wit; she's a classic dazzler... Michael Keaton's manic-depressive hero remains a remarkably rich creation. And Danny DeVito's mutant Penguin—a balloon-bellied Richard III with a kingdom of sewer freaks—is as hilariously warped as Jack Nicholson's Joker and even quicker with the quips." Conversely, Roger Ebert of the Chicago Sun-Times gave the film two stars out of four, writing: "I give the movie a negative review, and yet I don't think it's a bad movie; it's more misguided, made with great creativity, but denying us what we more or less deserve from a Batman story. No matter how hard you try, superheroes and film noir don't go together; the very essence of noir is that there are no more heroes." He compared the Penguin negatively with the Joker of the first film, writing that "the Penguin is a curiously meager and depressing creature; I pitied him, but did not fear him or find him funny. The genius of Danny DeVito is all but swallowed up in the paraphernalia of the role." Jonathan Rosenbaum called DeVito "a pale substitute for Jack Nicholson from the first film" and felt that "there's no suspense in Batman Returns whatsoever". Batman comic book writer/artist Matt Wagner was quoted as saying: "I hated how Batman Returns made Batman little more than just another costumed creep, little better than the villains he's pursuing. Additionally, Burton is so blatantly not an action director. That aspect of both his films just sucked." Ty Burr in Entertainment Weekly gave the film a B-; he wrote that "Burton still hasn't figured out how to tell a coherent story: He's more interested in fashioning pretty beads than in putting them on a string.... Yet for all the wintry weirdness, there's more going on under the surface of this movie than in the original. No wonder some people felt burned by Batman Returns: Tim Burton just may have created the first blockbuster art film." A "parental backlash" criticized Batman Returns with violence and sexual references that were inappropriate for children despite being rated PG-13. McDonald's shut down their Happy Meal promotion for the film. Burton responded, "I like Batman Returns better than the first one. There was this big backlash that it was too dark, but I found this movie much less dark." It was part of Empire's 500 Greatest Films in 2008 at number 401. "After the traumas of Batman Returns she has amnesia, and she doesn't really remember why she has all these bullet holes in her body, so she goes to relax in Oasisburg. What Gotham City is to New York, Oasisburg is to Las Vegas-Los Angeles-Palm Springs. [It's a] resort area in the middle of the desert. It's run by superheroes, and the movie has great fun at making fun at the whole male superhero mythos. Then they end up being not very good at all deep down, and she's got to go back to that whole Catwoman thing." Batman Returns was released on DVD on February 9 2009. Batman Returns was released on Blu-Ray on April 20 2010. Batman Returns is scheduled to be released on 4K UHD Blu-Ray on June 4 2019. ^ a b c Brian D. Johnson (June 22, 1992). "Batman's Return", Maclean's. Retrieved August 14, 2008. ^ "Batman Returns (1992)". Box Office Mojo. Retrieved July 23, 2012. ^ "TIL Jack Nicholson and Danny Devito were childhood friends. Their parents owned a hair salon together. • r/todayilearned". reddit. ^ a b "'Batman Returns' at 25: Stars Reveal Script Cuts, Freezing Sets and Aggressive Penguins". ^ "Did Marlon Brando Almost Play The Penguin In 'Batman Returns'? Not Exactly, Says Tim Burton". ^ "Meryl Streep - Trivia". www.notstarring.com. ^ a b c "'Batman Returns' Is 25 and Other Yummy Mindhole Blowers". March 21, 2017. ^ "Batman YTB". Archived from the original on January 29, 2009. Retrieved May 21, 2009. The script gave the writer (Daniel Waters) license to create his own villain in the form of Christopher Walken's nefarious Max Shreck, named after Max Schreck, the star of F.W. Murnau's NOSFERATU (1922). ^ Terror, Jude (November 30, 2016). "Twenty-Seven Years Later, Billy Dee Williams Is Two-Face In (Lego) Batman Movie [Updated]". Bleeding Cool News And Rumors. ^ "Batman Returns (1992)". March 23, 2014. ^ "Remembering actor Burgess Meredith, who passed away 19 years ago". ^ Alan Jones (November 1989). "Batman in Production", Cinefantastique, pp. 75—88. Retrieved August 14, 2008. ^ a b c d e f g h i j Jeffrey Resner (August 1992). "Three Go Mad in Gotham", Empire, pp. 39—46. Retrieved August 14, 2008. ^ a b c d e f g h Judy Sloane (August 1995). "Daniel Waters on Writing", Film Review, pp. 67—69. Retrieved August 14, 2008. ^ a b c Hanke, Ken (1999). "Batman on Burton's Terms". Tim Burton: An Unauthorized Biography of the Filmmaker. Renaissance Books. pp. 117–122. ISBN 1-58063-162-2. ^ a b Hughes, David (2003). "Batman". Comic Book Movies. Virgin Books. pp. 33–46. ISBN 0-7535-0767-6. ^ Rabin, Nathan (February 25, 1998). "Wayans world". The A.V. Club. Retrieved August 14, 2008. ^ "'Batman 3'". Entertainment Weekly. October 1, 1993. Archived from the original on September 21, 2008. Retrieved August 16, 2008. ^ Broeske, Pat H.; Thompson, Anne (August 9, 1991). "Big-Game Hunting". Entertainment Weekly. Retrieved August 14, 2008. ^ Gerosa, Melina (January 30, 2007). "Odd Woman Out". Entertainment Weekly. Retrieved April 17, 2012. ^ a b c d e Salisbury, Mark; Tim Burton (2006). "Batman Returns". Burton on Burton. Faber and Faber. pp. 102–114. ISBN 0-571-22926-3. ^ a b c d Michelle Pfeiffer interview on Batman Returns - Inside The Actors Studio. Youtube. March 21, 2017. Retrieved December 20, 2017. ^ Broeske, Pat H. (June 12, 1992). "Flashes: Kicking, The Habit". Entertainment Weekly. Retrieved August 14, 2008. ^ "Batman Returns". Tcm.com. Retrieved February 22, 2013. ^ a b Owain Yolland (August 1992). "Two minutes, Mr Penguin", Empire, pp. 89—90. Retrieved August 14, 2008. ^ "Batman returns filming locations". Movielocations.com. Retrieved June 25, 2016. ^ Daly, Steve (June 19, 1992). "Sets Appeal: Designing Batman Returns". Entertainment Weekly. Retrieved August 14, 2008. ^ "When hell burst through the pavement and grew: Anton Furst conjured up Batman's Gotham City. In England he was a creator of dreams. But in Hollywood his dreams ended. Simon Garfield reports". The Independent. Retrieved October 1, 2014. ^ Judy Sloane (August 1995). "Bo Welch Interview", Film Review, pp. 66. Retrieved August 14, 2008. ^ Tim Fennell (August 1992). "The Catsuit", Empire, pp. 47—49. Retrieved August 14, 2008. ^ a b Hannah Lack (July 12, 2012). "Costume designer Mary Vogt on Michelle Pfeiffer's Catsuit". AnOther Magazine. Retrieved December 20, 2017. ^ Creating The Catwoman Suit 'Batman Returns' Featurette. Youtube. November 1, 2017. Retrieved December 20, 2017. ^ "Danny Elfman presents his Tim Burton movie scores at Adelaide Festival". Sydney Morning Herald. Retrieved October 16, 2014. ^ a b "Batman Returns (1992)". Box Office Mojo. Retrieved August 14, 2008. ^ a b "1992 Yearly Box Office Results". Box Office Mojo. Retrieved August 14, 2008. ^ "1992 Worldwide Grosses". Box Office Mojo. Retrieved August 14, 2008. ^ "Batman Returns". Rotten Tomatoes. Retrieved September 1, 2017. ^ Janet Maslin (June 19, 1992). "Movie Review—Batman Returns". The New York Times. Archived from the original on February 19, 2012. Retrieved November 17, 2009. ^ Peter Travers (February 7, 2001). "Batman Returns". Rolling Stone. Archived from the original on November 4, 2007. Retrieved August 14, 2008. ^ Howe, Desson (June 19, 1992). "Batman Returns". The Washington Post. Retrieved August 14, 2008. ^ McCarthy, Todd (June 15, 1992). "Batman Returns". Variety. Archived from the original on October 8, 2010. Retrieved August 14, 2008. ^ "Batman". Roger Ebert. Archived from the original on August 7, 2008. Retrieved August 14, 2008. ^ Jonathan Rosenbaum (June 19, 1992). "Batman". Chicago Reader. Retrieved August 14, 2008. ^ Bill "Jett" Ramey (September 30, 2006). "Interview: Matt Wagner". Batman-on-Film. Retrieved August 14, 2008. ^ Burr, Ty (October 23, 1992). "Video Review: Batman Returns". Entertainment Weekly. Retrieved April 17, 2012. ^ Olly Richards (September 1992). "Trouble in Gotham", Empire, pp. 21—23. Retrieved August 14, 2008. ^ a b "AFI's 100 Years...100 Heroes & Villains Nominees" (PDF). Retrieved August 5, 2016. ^ "Empire's 500 Greatest Films". 2008. Retrieved September 10, 2016. ^ Michael Fleming (June 17, 1993). "Dish". Variety. Retrieved August 14, 2008. ^ Michael Fleming (July 22, 1993). "Another life at WB for Catwoman and Burton?". Variety. Retrieved August 14, 2008. ^ Michael Fleming (January 13, 1994). "Seagal on the pulpit may be too much for WB". Variety. Retrieved August 14, 2008. ^ Tim Egan (August 6, 1995). "Michelle Pfeiffer, Sensuous to Sensible". The New York Times. ^ Michael Fleming (April 2, 2001). "WB: Judd purr-fect as Cat". Variety. Retrieved August 14, 2008. ^ "Batman Returns DVD Release Date". DVDs Release Dates. Retrieved April 12, 2019. Wikimedia Commons has media related to Batman Returns. This page was last edited on 21 April 2019, at 01:22 (UTC).